A Qatari youth celebrates in December 2010 after the emirate was awarded the 2022 World Cup. Qatar conundrum: Can the 2022 World Cup be moved? It looks like I might have a problem. I might not be able to make my Great Aunty Joan’s 105th birthday party. She’s going to be devastated. You see, just as we can always rely on day turning to night, my sister turning up late, and England losing on penalties, we’ve also always known that the football World Cup takes place every four years, in June and July. My family unfailingly plan their birthday celebrations, weddings and funerals around it. But now Great Aunty Joan’s party is under serious threat. It’s in the diary for November 2022. When not only her party, but also normal world order, looks set to be turned upside down. It will be World Cup time. Yup, Qatar 2022 World Cup time. Or it will be if certain members of the football community have their way. Blatter expects a meeting in Zurich on October 3-4 to approve the change, and begin consultation on the best time for Qatar to host the tournament. But this is where the fun and games really start. FIFA may be world football’s governing body, but the world doesn’t exactly agree on the way forward. The United States, Japan, South Korea and Australia were the countries that lost out in the fight to host 2022. Frank Lowy, chairman of the Football Federation Australia, said from the moment his country lost the vote in 2010 that he’s not giving up hope. Best case for them, a new host country gets picked – but if the tournament date gets moved, then there’s talk of legal action. After all, back in December 2010 the FIFA ExCo members were asked to vote on a tournament to take place in June and July, and that’s the basis on which bids were submitted. What about Europe? UEFA president Michel Platini voted for Qatar, but as a former player he has now admitted that it would be awful having to play in temperatures that can reach 50C. The Frenchman is in the camp of moving the tournament by date, not country. Germany’s Karl Heinz Rumenigge is keeping his cards very close to his chest – but the same can’t be said for the English. While the Football Association’s new chief executive Greg Dyke admits a change of date is more likely than a change of venue, the English Premier League is firmly in the camp of wanting a new bidding process. It is one of the few European leagues to have long opposed having a winter break – so a winter World Cup is its worst nightmare. EPL officials point to the huge upheaval it would mean administratively and for the golden goose of television – saying it will have a major impact on three seasons of scheduling. CONCACAF president Jeffrey Webb, who represents the North/Central American and Caribbean associations, insists player welfare needs to come first – and says it’s about showing them the necessary respect. And a recent study by an English university says “players' bodies could adapt to the extreme conditions if the squad arrives in Qatar early enough.” The unversity's head of sports science John Brewer, who worked with England's team at the 1990 World Cup in Italy, suggested that would mean a month before the tournament. The Qatari organizers are playing it considerably cooler than their summer temperatures. They know they won the vote to hold the tournament in July – but are very sensibly letting the rest of the football world get their knickers in a twist, saying they’ll be able to put on the tournament whenever they’re asked to. You want it in winter? We’ll make it happen. You want it in summer? We’ll spend the money to air-condition the stadia and training grounds. No-one seems to have found a solution for air-conditioning a whole country, though, even if it is the wealthiest on the planet. By the way, the FIFA ExCo members knew there were problems with the heat in Qatar when they voted – it was written in the technical reports. And that committee is in charge of world football’s calendar. The calendar is set until 2018, with the next round of scheduling addressing 2019-2022. Talk of a move into January or February 2022 looks to be out of the question because it would clash with the Winter Olympics – so if the tournament is moved, then November/December that year is the most likely. The problem FIFA has – how to compensate Qatar if it takes away the world’s greatest sporting tournament? But how to appease Great Aunty Joan if it is moved to November 2022? I have a solution for the Qatar world cup, but it will cost FIFA $10 million, if they want to know. Apart from that, please refrain from reporting on the most boring game in the world. There are other sports you know, like Archery, Gymnastics, Hockey, Table Tennis, Squash, Badminton etc. Soccer is the most widely watched sport in the world. Just because you have absolutely no taste pertaining to it does not mean that other people are as bland in their taste. Soccer is the best sport in the world. Deal with it you, yank, ay m8? You are correct, it is the most watched. But I would not go so far and call it the best sport in the world. One has nothing to do with the other. There are certainly a lot of better sports out there, even such where you have to use your brain. not sure if serious or joking. How come a fricking badminton match can be cooler than a world cup final between Brazil and Argentina in Brazil? By far the most popular sport in the world, anyway you look at it. your miniscule opinion is useless. Archery and hockey are the most boring sports i've known. Football is the beautiful game. Spoken like a true American – anything you don't understand/comprehend is boring and worthless. Will players of all religions be allowed to participate, or will there be restrictions? If Qatar has offered to pay to air condition the stadiums, then what's the problem? The problem is that, as its never been done before, no one knows if its even technically feasible. In any case the energy requirements would be enormous – not just the main stadiums, but training facilities as well, which would all have to be enclosed. Are there not human beings living in Qatar throughout the year? Sergio, even if the stadiums are air-conditioned, I'm not sure tourists are going to flock to a place where summer temperatures are around 50C outside in the summer. You really cannot be outside, you cannot walk anywhere. And if on any day it gets humid, much much worse. I've been living in this region for six years and I would not be caught dead outside in the summer. The problem is that you are going to spend an average of one hour per day for every day you are there, either travelling to or watching your team play. Allowing for 3-5 day gaps between games, that means most days, you will be cooped up in your hotel 24 hours a day. Football fans are probably the same as most other fans, and when they are "off duty", they want to see the sights, and visit bars and go shopping. This is a country where nearly all the bars are in hotels, and I am sure they will not take kindly to having hundreds of fans enjoying themselves the way travelling supporters do. Now add to that, the stadiums are going to be roofed with large AC units over head, and erector sets, quite apart from the lack of ambience for the visitors, the term "An accident waiting to happen" springs to mind. People and press now need to go back and question each and every one of those FIFA members who voted for Qatar. What were they thinking? Or was it the pricey gift bag they had in mind (and don't tell me that doesn't happen!? Summer tournament in Qatar is going to be a horrendous experience. They can air-condition the stadium and training facilities (not that it would help the players much) but what about the fans? They are thinking of everyone but the fans' experience in Qatar. And air-conditioning the whole stadium? Qataris can do it because they have money, but shouldn't FIFA have at least some sense about its carbon footprint? For the health of players is just a kind of smoke as the Qatar's bidding document stressed the provision of air conditioning systems that can reduce temperatures from 50 to 27 °C (122 to 81 °F). The bidding committee also proposes to use such cooling technologies in fan-zones, training pitches and walkways between metro stations and stadiums (Worldfootballinsider.com. 28 April 2010). If the Qatar bidding committee is going to eat their words, then FIFA should declare the Qatar's holding right of the 2022 waived. As such, re-bidding should take place. This is the ugliest scandal upright in the public. While FIFA and most decent soccer fans are against match-fixing, this UEFA head wittingly chose a very bad location because of some of his non-monetary-direct reasons, promising in advance that he would change from summer to winter should Qatar won. Even non-monetary-direct, this is a cheat obviously. Why is he so shameless? "You can't take it away unless you discover something unethical"? There is no unethical thing in the bidding side yet, but one of the Exco members has already admitted his unethical promise. The next piece of suspicious conspiratorial element is the timing. Why this bidding and awarding had to be so unprecedentedly early? Not 8 years earlier but 12? Was someone (or were some people) wanting to give this not well structured country of 1.8 million population to have enough time to build up infrastructures for accommodating around 3 million people (South America’s figure)? Please, Please,Please. The issue is dead – the deal is done, the bribes have been paid. The World Cup WILL be played in winter. Now the only way to change this is for several countries (England, Italy, Germany, Spain and others,) to boycott the tournament. If you are presented with several bids to vote on and after the contract is awarded the bids are changed to accomodate a particular party, the contract is void (basic contract law) Sorry I forgot Blatter has received his bribe. The problem with a boycott, is that by the time this takes place, Blatter will be elsewhere counting his ill-gotten gains. The man being tipped as his successor is Platini, who heads UEFA. I am not optimistic that Platini will do the right thing if it means wrecking his own tournament. Platini should be acting now, saying that (1) it is unacceptable for the game to be played in European Winter (2) That the technology must be tried and tested before 2016 (3). The Qataris should explain what facilities there are for supporters in between matches. If they cannot resolve these issues satisfactorily, then Europe should boycott the comp. The World cup in Qatar will be successful over the Blood ,Sweat and Tears of millions of immigrant laborers who will be shipped to Qatar for this grandiose,lamentable event. But who gives a diddly poo as long as we can sit back in our A/c homes and enjoy the beautiful game with a chilled beer. I am a great fan of football but I will be willing to boycott this event for the misery and death it'll bring to slave laborers. Utterly disgusted with FIFA and the officials who voted for QATAR(everyone knows why they voted the way they did). Excellent point Phil. It's funny that the only question seems to be whether or not Qatar CAN pull off the immense task of air conditioning all the needed facilities...instead of SHOULD they, or HOW they will do so. Soccer is by far the most popular sport!!!!! Whatball? Baseball? I thought that game died of steroids? Football! Football! Football! Pele! Maradonna! Zidane! Ronaldo! The heat is only one of the issues. Isn't Qatar a "dry" country? What refreshing beverages will they drink? How can CNN misspell the word "conundrum" to condundrum? Will somebody from CNN make this necessary correction, or it'll lose it's editorial credibility, at least to my eyes? Thanks. I wonder if Blatter and his corrupt cronies will refund the millions of dollars in bribes they took from the Qataris? It high time the fans take action on this. Clearly Qatar bought this World Cup, with so much money that it blinded the FIFA officials from the obvious issue of the heat and the irrelevance of this country from a football or geopolitical point of view. We need to start a boycott the world cup movement. Would be nice lesson if they held it world cup in air conditioned stadiums but no one showed up. FIFA should learn that fan loyalty is not for sale! I am Qatari and I have one question, why its ok to play in a snowy country or rainy but not in a sunny one ? As you know, no Qataris work outdoors, if they do work. You will know the differnec between playing football in cold temperatures and in heat, dust and humidity of Qatar when you try it. Most of Qataris leave the country in the summer, as you well know. Its not about Qatar, its about the health of the players and the fans and in this case about the disgrace of human kind being so greedy and corrupt! The WC would be OK in Morocco, Algeria, Tunisia, Jordan, Iraq, Afghanistan, Iran, etc… All countries with several cities and with relatively bearable temperatures in June. It’s not about an anti-Arab host, it’s just it’s not the right country size, not the right climate and not the right time! Give it to Australia we have beutiful conditions in June/July amazing stadia and our people are friendly. Look at the Olympics in Sydney !! Give the world cup to Morocco (who the fifa screwed in 2006 and 2010 because the country did not know who to bribe). the weather is arguably the best in the world all year long, world class stadiums are ready NOW!, great infrastructure, huge hotel capacity, already one of the world's top tourist destinations, and yes... it is an Arabic country! there! problem solved! They (Qatar) support Al Qaeda in Syria like USA, so I think these two countries (QATAR AND US) should not be allowed in world cup at all. second thing do you have any prove at what you just said ? in the end people like you (ignorant) should not talk or give opinions. this is a respectful site and the topic is about world cup not about wars and diplomatic, we are talking about the weather. Its Al qaeda and you know that! Qatar is supporting the Syrian people against Chemical, Murderous, Dictator Asaad. You are mixing between the Free Syrian Army (FSA) and Jabhat Al Nusrra where the FSA is fighting the dictatorship and criminal Asaad regime and extremists at the same time. Please don't try to fish in the murky waters. Qatar is supporting the Free Syrian Army against Chemical Asaad. The Free Syrian Army is liberating Syrians from dictatorship of Bashar and Jihadists extremism at the same time. This was a particularly stupid decision by Blatter and co and has a faint stink of backhanders. I've been to the region on August and it was insanely hot even at midnight; it was 42C with abut 90% humidity. People won't travel and even if they do they won't be able to enjoy themselves outside because of the heat. If they reschedule the world cup to another venue, will FIFA executives and Board members have to return the bribes from the Qatar sponsors? and I heard that Fifa will move the World Cup 2022 to winter 80%. Host countries normally 'fit' the income of tourism by splitting it in several cities and several stadiums. This would not be the case for this one. The overcrowded situation would be horrible. Most people do have holidays in summer. October-December most people don't have holidays, or not as long as summer. This is really poorly tought, not holding anything against the host nation, who's clearly showing willingness, but this is about practical, intelligent and workable solutions. There is not enough capacity to hold visitors, there is not enough restaurants to feed the visitors, there are not enough bars to quench the thirst, there is no way to spread the load. Since it's winter there would be less visitors than normal (theoretically), which will mean less money for FIFA, the difference will be covered by the host nation ... issue solved. So FIFA is happy ... football might not be ... but that's not important to FIFA I guess? You obviously know nothing about the logistics of running a WC. It is held in June July, so that players will have had short break before and after. There are about three weeks of training camps. So effectively, the players are away for two months. If It is held in December, the players will want to be with their families for this time. The season ends Mid May in Europe, and the first UEFA comps start around 30th June. So it will requre these payers to play until say December. Stop the domrestic season for two months. Return home, and then carry on playing until mid July to finish their domestic seasons. This in turn will mean that the UEFA comps cannot start until mid July, which is also the time players are returning from their summer holidays. If you are a player that is playing in both the WC and UEFA Comps, including training, then you will have to work non-stop from June 2022 to May 2024 without a break, and in June July 2024, there is the European Nations Tournament. No sooner has this ended and they start the qualification for the 2026 WC as well as other UEFA comps. Don't misunderstand me. I love watching the game, but I prefer to watch athletes at their peak, rather than tired worn out workhorses, which is what we will have if the WC is rescheduled to European Winter. Qatari summers are extremely hot, night and day. There is the humidity factor that makes 50 C feel like 60C. At night the temperatures go down to 30 – 35 C but the humidity makes it unbearable to walk or stand outdoors for periods longer than 10 minutes. If you do so, you will be covered with sweat. Besides the humidity, we get sand storms quite often in this period of the year. Many times the skies in Qatar in June –July are yellowish-grey and the air is not breathable. Maids and labor in Qatar (and all GCC Countries) make 150 to 200 US$/month. There are no laws to protect these workers from systematic abuses, not even a law to establish a minimum salary! Often these workers have to pay 1000+ US$ to obtain a working visa, just to find out that they have to work for almost a year to pay back that fee. Their passports are removed and their movements in the country are conditioned. Either they are just allowed to leave the house with their employers (no day off) or in case of the labors, on their day off, they are not allowed to go to shopping malls, the souk and cornice (road by the sea). Qatar has a labor law that facilitates slavery and has climate conditions in the summer that are close to lunar atmosphere! Not to mention that the local culture is not compatible with the World Cup festivity culture! Also not to mention that Qatar only has one city with very poor infrastructures and congested traffic! When on earth the world cup was organized in one city only? The whole world knows it was a mistake to award this event to Qatar. If they knew Qatar like I know (I live here) they would have been shocked with disbelieve of the obscene and irresponsible FIFA’s decision. Well besides the temperature (heat) issues, which according to organizators could be fixed. We all know that drinking would be an issue. Partying in the streets would be an issues. Doing what fans normally do in FIFA WC would be an issue. I do not know if the organizators can change this. Don’t try to confuse people again. The issue is not about “sour grapes”, “unjustified arrogance” and “bigotry”. The issue is about a breach of bidding condition and cheating pre-bidding fixing. Australia asked FIFA to have the tournament in winter before the bid but refused by FIFA. Haven't you forgotten? Or pretend? All those air-conditioning things are lies. Haven’t you remembered ‘Al-Thani said that the stadia, training areas and fan zones will be air-conditioned to 27 degrees? However, that UEFA head pre-fixed a change to winter before the outcome of the bidding process. Don’t make up reason like the area has never host a world cup. There are many other places that have never held a world cup. How about the Oceania Confederation? How about Indonesia? How about Australia? Don’t bring up excuses to hide the cheat. 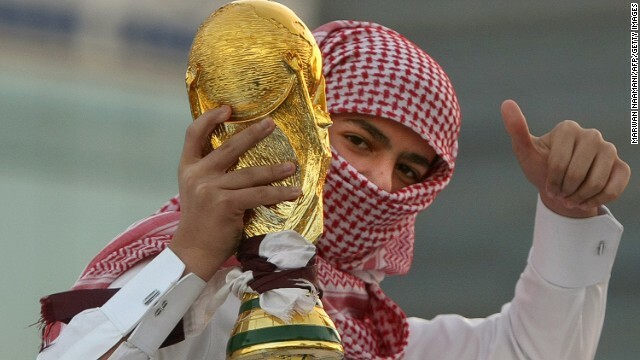 No one ever said Arabian people of countries cannot hold a world cup. You just created a self-served saying to cover up the cheating. Similarly, there is no relation to religion too. If there is “unjustified arrogance”, this term should be referred to the monetary power to make this 2022 World Cup successful. This is about breaching of bidding condition and pre-bidding fixing. This is about cheating. The entire success of the Qatari bid doesn't pass the smell test. How could any truly independent and competent group of individuals award an athletic event that brings with it millions of fans to a nation where it is a near impossibility to exist out of doors in summer? Throw in the fact that the bidding was done 4 years earlier than normal – 12 years ahead of time rather than the normal 8 – and you've got the icing on your Successful Bribe cake. FIFA's no different than the governing bodies of the American sports – they go where the money is without fail. It cannot have come as a surprise that Qatar is not habitable in the summer. The decision to award the WC finals to Qatar cannot possibly have been made on the merits. Isn't it time to find out why those who voted for it did so? Then we can move it to a country with a temperate clime, a football tradition, and a few stadiums. My solution is to play in the summer as scheduled and in accordance to world order, in air conditioned stadiums as offered by Qatar and have kick off times at 6:00 PM, 8:00 PM and 10:00 PM. I hope Sunil Gulati stay firm to oppose the ridicuous idea to play in the winter. The problem with your solution is that matches will be finishing at 21.00/23.00/01.00 CET and 5-7 hours later in Asia (BKK-Tokyo) which are the largest TV markets. If the culture is similar to the UK and SEA, most people will watch the match amongst their friends in a bar, and will then have to report to work. Aware that the "bosses" are not going to like this, the price of the TV rights will fall dramatically, and that's where the real money is. Could they not play all games at 1 or 2 o'clock in morning, it's got to be cooler then at night. we all could get use to the time changes, where ever we all live in the world, as we always do.